the first LNG delivery in Spain from the US via the Sestao Knutsen, arrived at the Reganosa terminal at Ferrol in northwest Spain on July 22. 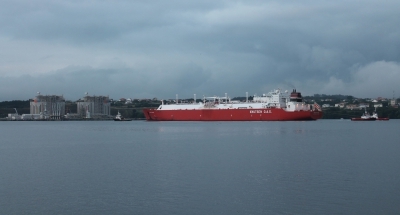 The tanker Sestao Knutsen, with 138,000m³ of LNG aboard, arrived at the Reganosa terminal at Ferrol in northwest Spain on July 22, marking the first LNG delivery in Spain from the US, and the second US cargo to reach Europe. Both cargoes came from the Cheniere-operated Sabine Pass liquefaction terminal in Louisiana. Others from the US have been shipped in the meantime to Asia, Latin America and the Middle East. The ship departed again, having unloaded, on July 23. Cheniere estimates that the US will become the third largest LNG supplier in 2020 with a production capacity of 60mn metric tons/yr. A statement from Reganosa said that Spain will become a leading US LNG importer because it is the European country with the most terminals, and that its own terminal is the ideal place to receive such flows. The first US LNG cargo to be delivered to Europe arrived at the Portuguese port of Sines on April 26 2016 aboard Creole Spirit.